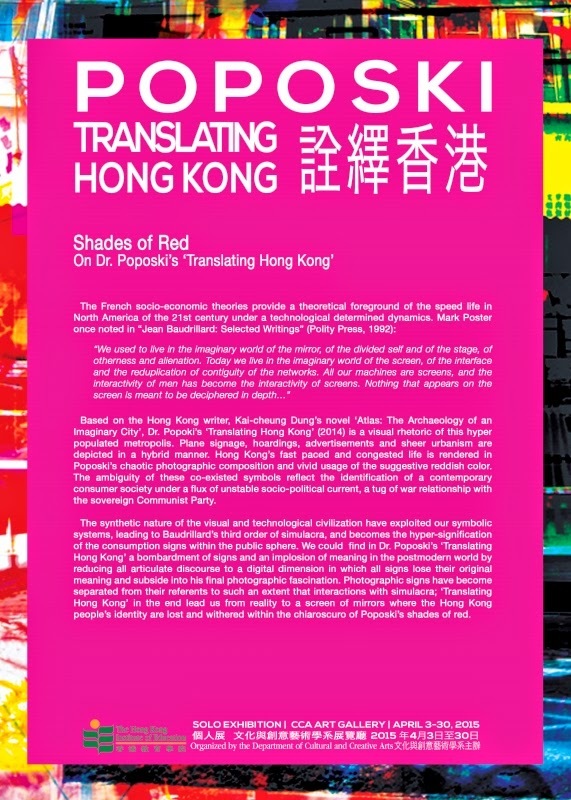 "Based on the Hong Kong writer, Kai-cheung Dung’s novel ‘Atlas: The Archaeology of an Imaginary City’, Dr. Poposki’s ‘Translating Hong Kong’ (2014) is a visual rhetoric of this hyper populated metropolis. Plane signage, hoardings, advertisements and sheer urbanism are depicted in a hybrid manner. Hong Kong’s fast paced and congested life is rendered in Poposki’s chaotic photographic composition and vivid usage of the suggestive reddish color. The ambiguity of these co-existed symbols reflect the identification of a contemporary consumer society under a flux of unstable socio-political current, a tug of war relationship with the sovereign Communist Party. The synthetic nature of the visual and technological civilization have exploited our symbolic systems, leading to Baudrillard’s third order of simulacra, and becomes the hyper-signification of the consumption signs within the public sphere. We could find in Dr. Poposki’s ‘Translating Hong Kong’ a bombardment of signs and an implosion of meaning in the postmodern world by reducing all articulate discourse to a digital dimension in which all signs lose their original meaning and subside into his final photographic fascination. Photographic signs have become separated from their referents to such an extent that interactions with simulacra; ‘Translating Hong Kong’ in the end lead us from reality to a screen of mirrors where the Hong Kong people’s identity are lost and withered within the chiaroscuro of Poposki’s shades of red."